Magtec, the UK’s leading designer and manufacturer of electric vehicle drive systems, is creating a number of highly skilled new jobs to help the business take advantage of growth opportunities in the high-tech global industry. The company will be recruiting for 19 engineering and related specialist positions to support the delivery of existing and new electric vehicle programmes in Britain and overseas. These include the world-leading electric refuse collection vehicle currently being trialled in Greenwich, London, the innovative electric drive system for a 7.5 tonne commercial vehicle, which is ideal for the urban daily deliveries market, and a technology-enabled commercial vehicle project in northern Europe. Magtec currently employs 71 people at its factories in Sheffield and Rotherham, adding 22 in the last financial year. Roles include production engineers, production manager, service manager, demand planner, health and safety manager and design engineers covering the software, electronic, electrical and mechanical disciplines. This year, Magtec has brought in young talent including apprentices recruited via Sheffield City College, engineering graduates recruited via the Sheffield City Region’s Rise programme, and teenage work experience placements welcomed from local schools. Alex Gorringe, a new apprentice at Magtec, added: “I used to work as a butcher in Grimsby, but I always wanted to do something in engineering and now I am a mechanical assembly apprentice. “It’s very hands-on at Magtec. I am paired with a senior colleague who is walking me through everything from start to finish. 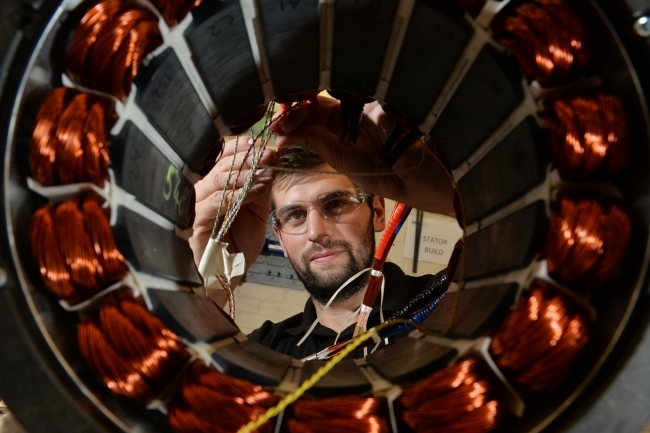 I am gaining lots of practical experience about how electric motors work. In the future, I hope to be able to use this experience in the design of our products. HR Manager, Sinead O’Neill, who joined the business in September 2017 concluded: “We have ambitious growth plans. We have the world knocking on our door and we need to recruit.